Buckwheat is not a derivative of wheat, in fact it does not belong to wheat family at all. Buckwheat seeds are eaten as groats or flour; hence it is referred to as a pseudo cereal too. Buckwheat is high in essential nutrients. It is rich in many trace minerals, including manganese, magnesium and copper. It is also a good source of the B vitamins: B6, pantothenic acid, niacin, folate, thiamin and choline. You can read more about buckwheat from here and here. It is also known as ‘kuttu’ locally in Mumbai and used for Hindu fasting meals. I try and incorporate such healthy ingredients in everyday cooking wherever possible. I am sure there are better and healthier ways to consume this powerhouse. But, till I find more ways to cook this grain I am happy with these waffles. My son too consumed these ‘chocolate waffles’ (for him anything brown is chocolate;) with complete admiration. Here I have topped these waffles with ready to use whipped cream (Result of my impulse grocery shopping). But you can top these waffles with fresh fruit, honey or maple syrup. The photos were clicked on the dining table itself as Avvi refused to wait longer and hence are not up to mark. But on a good note, I feel so happy when Avvi devours something which I make. I am one satisfied mother. Take milk in a bowl, add vinegar and set it aside to curdle. Meanwhile mix buckwheat flour, maida, baking powder, salt and sugar. To the curdled milk add water and oil and vanilla extract and mix well. Add dry ingredients to wet and make a lump free batter. Adjust water to get pouring consistency if required. Let the batter rest for 8 to 10 mins. Meanwhile preheat the waffle iron. Brush the plates with butter and pour a ladle of batter at a time so as to cover the plate. Cook the waffles according to manufacturer’s directions. Mine were done in about 4 minutes. Enjoy with your favourite topping. Here I have used whipped cream and chocolate syrup, but can use fresh fruits, honey or maple syrup. I usually make cookies on weekend to pack it in the snack box for my kid during the week. But cookies do have a considerable amount of fat even though I try to reduce it as much as possible. So recently, when I happen to come across peanut butter cookies here, I wanted to give it a try. Peanut butter along with whole wheat it makes a wholesome snack. I have used homemade peanut butter which has no added sugar. Also, the criss-cross pattern on a typical peanut butter cookie makes them look so pretty. Mix together peanut butter, sugar, vanilla and milk. Mix well so that all the ingredients are combined well. Separately sieve together atta, baking soda, baking powder and salt. Add this atta mixture to the peanut butter mixture and form a soft dough. Chill the dough for 15 minutes in the fridge. Meanwhile, preheat the oven to 180 degree Celcius. Make balls with the dough. (I used 1 tbsp as my measurements as I prefer smaller cookies.). Press the balls onto the parchment lined cookie tray making a criss-cross pattern. Bake for 8 to 10 mins. The cookies will be soft on the top and the edges will be deeper in colour when the cookies are done. Time taken for baking varies from oven to oven and also depends on the size of the cookie, so adjust accordingly. Cool the cookies on the cooling rack and keep them in airtight containers on cooling completely. Note : I halved the recipe given above and got around 12 cookies. We really don’t have a ritual for Valentine’s day, but rather just go with the flow. Today it was celebrated with the whole family around the breakfast table. It was wonderful. Coming to the recipe, this is one of those recipes which is just awesome and happens by accident. We really don’t eat fresh figs and I had a dozen to finish. Fig jam was obvious and tried, so decided on making a cake and an ice-cream. I had my fingers crossed with the cake in the oven because it was the first time I was using fresh buttermilk. (Here, I have used the buttermilk which remains after removing the butter for ghee.) It turned out just wonderful and was liked by all. I decided to call it a brownie because of the taste, texture and the amazing cracked top. It’s an easy and a healthy recipe. I know it has butter, but I believe a controlled amount of good fat is essential for your body. I have adapted this recipe from the chocolate beet cake recipe. Sieve together all the dry ingredient and combine it well. In another bowl cream butter and powdered jaggery. Then add pureed fig and buttermilk and mix well. Bake for 25 mins or till the toothpick inserted in the middle comes out clean. Each oven is different so the time required may vary. Let it cool in the pan for 20 mins and then on the wire rack till it is completely cooled. Slice and serve. Start your day with these yummy and healthy waffles. Yeah! healthy too with organic whole wheat and milk. They are so easy . . . so go ahead and make your mornings festive. Though it does not snow in the part of world where I stay, but the dusted sugar reminded Avvi of snowflakes, so I decided to post this recipe on Christmas. Sieve and mix all the dry ingredients well. Mix dry ingredients into wet and make a batter. Do not over mix. Add water to get the required consistency. I needed around 1/4 cup of water, but you may require a little less or more depending upon the kind of flour. I used organic whole wheat flour. Preheat the waffle iron and brush it with melted butter. Pour a ladle full over each square. Cook till indicated in your machine. Serve warm with sprinkling of sugar. I like it drizzled with chocolate sauce. You can serve it with fresh strawberries or honey too. I have a serious sweet tooth. Anyone who knows me also know this fact about me. 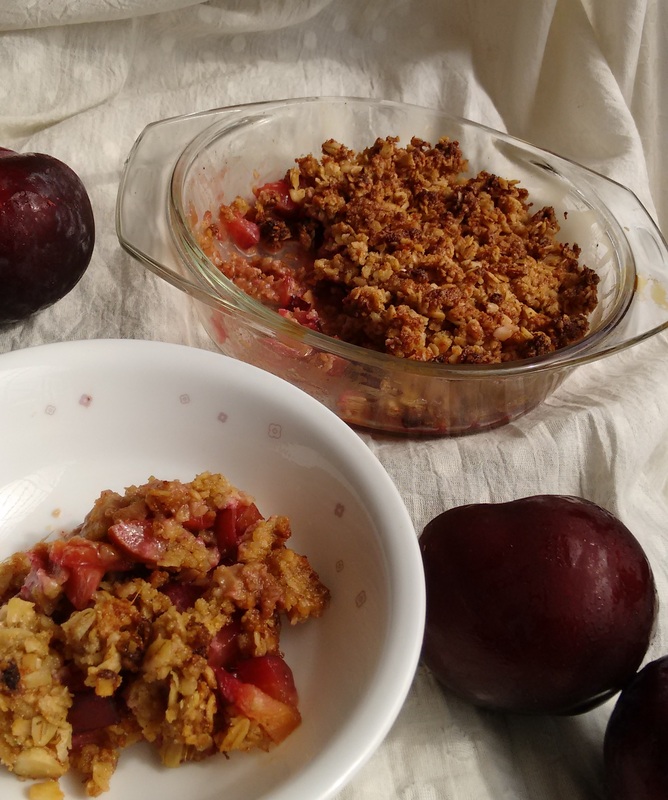 We had this plum crumble for Sunday morning breakfast . . . yes, you heard it right . . . . it is breakfast. A cool morning with sudden downpour, when the weather department have almost written off this year’s monsoon is a perfect excuse to have this sort of breakfast. Well! It has oats, amaranth, plums, almonds and unrefined sugar in form of wild raw honey and brown sugar. Sounds good ha!!! 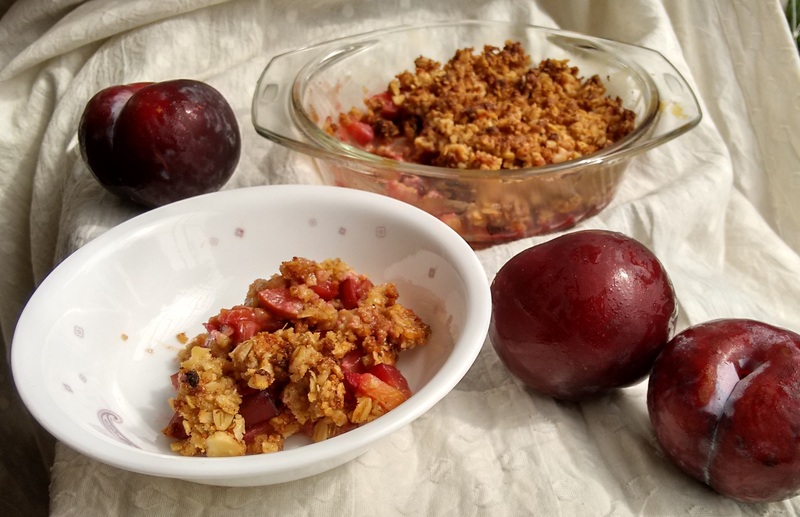 The tart plums pair perfectly with honey, almonds add some crunch and oats are a perfect base. And an awesome aroma fills your kitchen when you take it out of the oven. A simple recipe, quick to make and enjoyed eaten warm. You can replace plums with any stone fruit of your choice like cherries or peaches. To keep it healthier have it with a dollop of chilled yogurt or if you are in an indulgent mood slather it with good old vanilla ice cream. We also liked it plain and warm . . . the choice is yours. Go ahead and try it yourself. In a medium sized glass dish approximately 8” diameter, mix together the sliced plums, honey, cornstarch and cinnamon. Arrange the mixed plums in a single layer. In another bowl, mix together the oats, amarnth flour, powdered almonds, brown sugar, ginger and salt. Mix in the melted butter and yogurt. Stir until the mixture is moistened throughout. Spread the oats mixture evenly over the plums to cover them almost completely. Bake for 30 minutes or until the filling is bubbling around the edges and the top is golden. Let it rest for few minutes before digging in. Serve warm, as it is or with a scoop of vanilla ice-cream or yogurt. Note: Keep the topping ready and then work with the plums, to keep the moisture from plums under check. 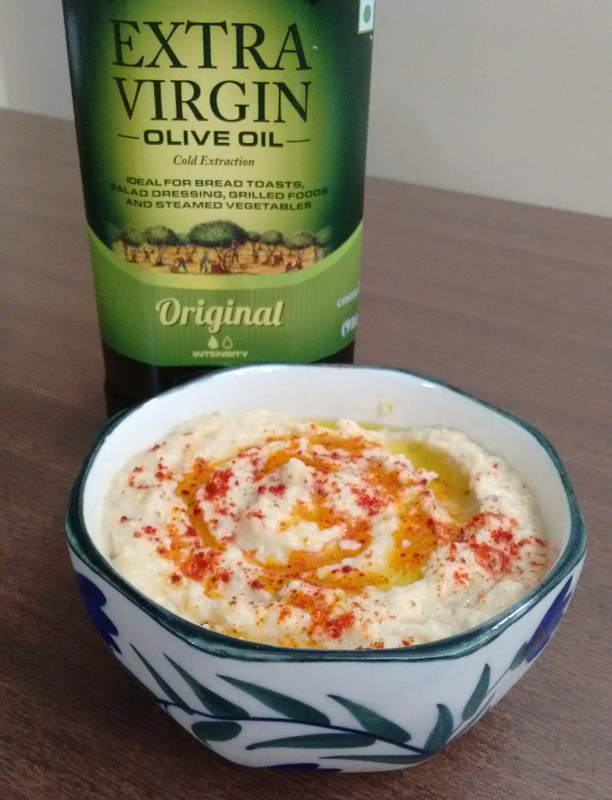 Hummus is a popular dip in Middle Eastern countries and is served in different variations. 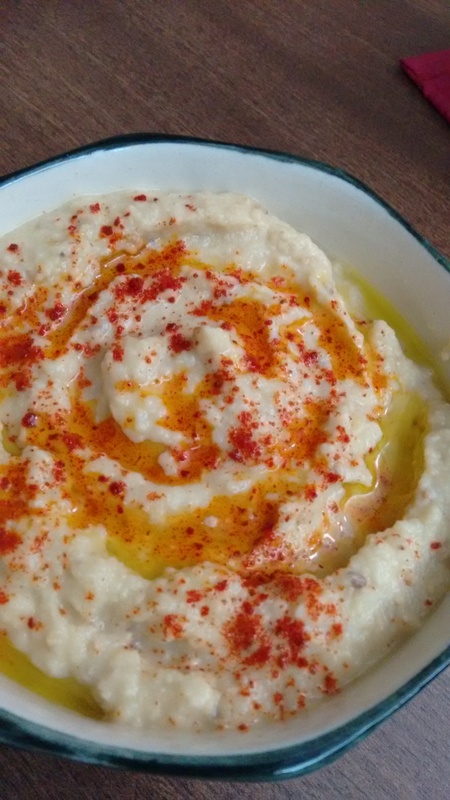 Today, I have for you, a basic recipe of hummus (adapted from here). It is kid tested and approved by my five year old. It is a simple recipe which can be prepared easily with ingredients present in an Indian household. The original recipe uses tahini, which does not feature in our regular Indian kitchens, so I replaced it with sesame seeds. Lemon juice brings freshness in this recipe and next time, I would definitely increase the quantity. 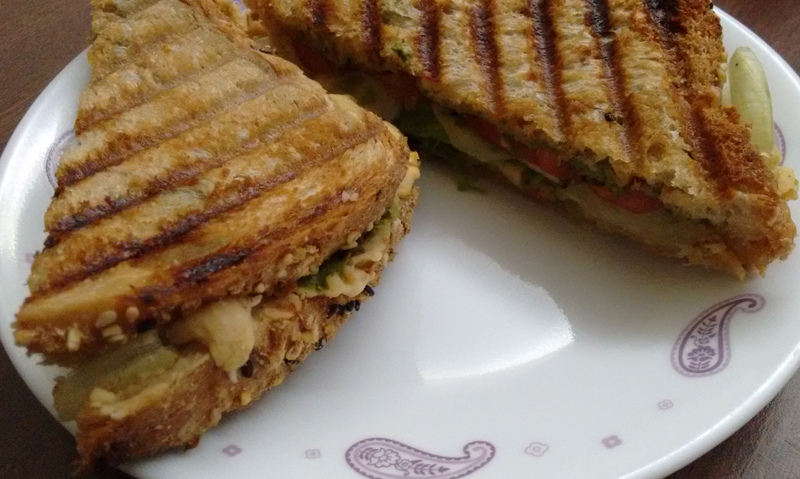 As for the sandwich, I used some iceberg lettuce, cucumber and tomatoes with hummus spread on the multi grain bread slices and grilled it.
. . . . . The leftover hummus went into my evening office tiffin to add some jazz to my usually boring khakhras. Hope you enjoy eating it as much as we did. Cook the soaked chickpeas in pressure cooker till soft. Drain the liquid and keep aside. Let the chickpeas cool completely before proceeding. I cooked the chickpeas a day before and stored in the fridge. If using canned chickpeas you can skip this step. Dry roast and powder the sesame seeds on cooling. In the same jar add the cooked chickpeas (garlic paste if using) and give it a blitz. Add couple of tablespoons (I used 2 tbsp) chickpea brine (drained liquid) to ease processing. Add olive oil and process till you get a smooth paste. Remove the paste in serving bowl and drizzle some more olive oil and paprika for garnish.